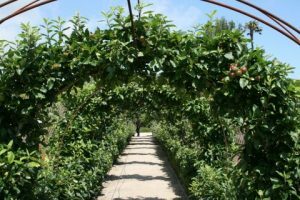 In Cornwall almost thirty years ago, beneath some 80 hectares (200 acres) of tangled bramble thickets, a garden was discovered. It had its origins around a house more than three hundred years old. 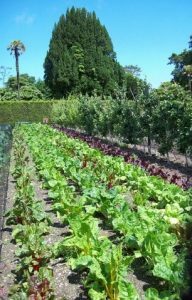 In the Victorian era it had been tended by progressive and experimental gardeners, successfully growing in cold England exotic fruits such as melons and pineapples using glasshouses, walls and composting pits to provide heat. 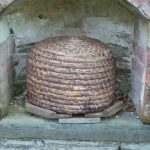 has its wall of bee boles and wicker skeps – the old way of keeping bees, although more traditional hives are now in use. 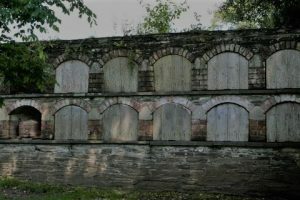 Doors on the boles helped keep out the cold while gaps at the bottom allowed bees easy access, but the woven skeps were often destroyed when collecting honey for sweetening and the wax for candles. Growing up we had a beehive in the far corner of our garden for our twenty or so fruit trees. But when the small boy next door had a severe allergic reaction to a bee sting my mother was quick to get rid of the hive. She said if the child were stung again and lost his life she couldn’t bear the thought one of our bees might have been responsible, even though other hives were in the area. Away with the hive went guaranteed pollination and sweet, sticky honey in the comb. I’m always reminded of this episode whenever returning to Australia from overseas since honey is a required declaration on the incoming customs card. It stems from Colony Collapse disorder wreaking havoc in many countries, but not Australia, where apiarists find their hives suddenly and inexplicably empty of all bees except for the queen and a few immature larvae. It’s devastating for beekeepers and to agriculture. Among the suspects are the varroa mite (not present in Australia), stress, climate change and pesticides. In agriculture the dire effect of the bees’ absence is well illustrated in two novels I’ve recently read: The History of Bees by Maja Lunde and How to Bee by Bren McDibble, where, because of the insects’ loss pollination is by human hand in a future world. As I write this, a report has just come though of a varroa mite infestation of a colony of bees found in a container on a cargo ship at Port Melbourne. 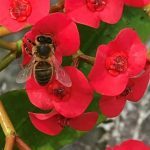 The alert captain reported seeing dead bees and alerted the authorities who have destroyed the remaining ill bees and the mites, keeping safe for now Australia’s agricultural industry that’s so dependent upon bees. I’m a bit late reading this post Diana but, as with all your posts, I found it fascinating. Now I’m off to locate that bee picture book text I have hidden away somewhere, perhaps in a bottom drawer. Would you consider including a ‘like’ button within your site? I LIKE this post. Thanks for the story. Nice idea, Julie. I’ll look into it. Another fabulous post, Diana. Two of my favourite things are bees and gardens. I love stories about abandoned gardens and very interesting to read about the old way of keeping bees.